The whole thing was re-discovered after years of construction on top, when houses built on the site began to get their cellars flooded from the spring water. Over the years, the houses were demolished and the full extent of the former Roman Baths was unearthed. As such, when you visit, you get a real sense of what the place was actually like in Roman times. The story of how the baths were discovered again after being partially destroyed and built upon is told in an exhibition inside. The biggest of the pools has a terrific view of nearby Bath Abbey and up until a few years ago, bathing was still allowed here. Today, you can’t enter the water but these are the best preserved Roman Baths we’ve ever been in and you should not miss out! 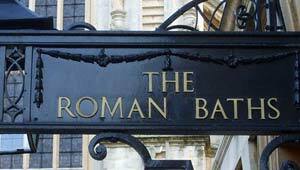 If you still want to bath in the waters of Bath, special packages are available to combine your visit to the Roman Baths with a visit to the Thermae Bath Spa and the Pump Room. See the links below. Admission to the Roman Baths includes the use of a free audioguide. We found this really useful in working out what things actually were. We recommend you allow at least 2 hours for your visit to the Roman Baths. The Roman Baths are in the courtyard next to Bath Abbey. Adult admission is £13.50 but this rises to £14 in peak season of July & August (2014 prices). The Roman Baths are open daily except 25th and 26th December from 9am in the summer and from 9.30am in the winter. The attraction closes at 5.30pm in the winter, 6pm in the autumn and spring and 10pm in July & August.